	Ivy Cottage is nestled on the fringes of Ross-on-Wye, with the convenience of walking distance to the town. Ross offers lovely riverside walks, an array of good shopping, dining and leisure facilities, also offering good primary and high school. The M50 motorway is just over 1 mile away and provides excellent commuter links to the M5 giving good access to Birmingham and the North and Bristol and the South. The A40 within 1 mile leads to the M4 at Newport, giving good access to Cardiff and Wales. 	There is excellent schooling including; primary schools at Brampton and Ashfield and John Kyrle High School in Ross. 	Ivy Cottage has been beautifully refurbished to provide modern and stylish accommodation whilst retaining its charm and character. 	The ground floor has stunning stripped pine flooring with feature fireplace and striking vaulted ceiling. The Shaker style kitchen has oak worktop and built in fridge freezer and dishwasher. 	Oak staircase leads to the lower ground floor with converted cellar offering great additional space. 	The first floor has bathroom with white suite and bedroom one which is currently used as another sitting room, with views across the rooftops. 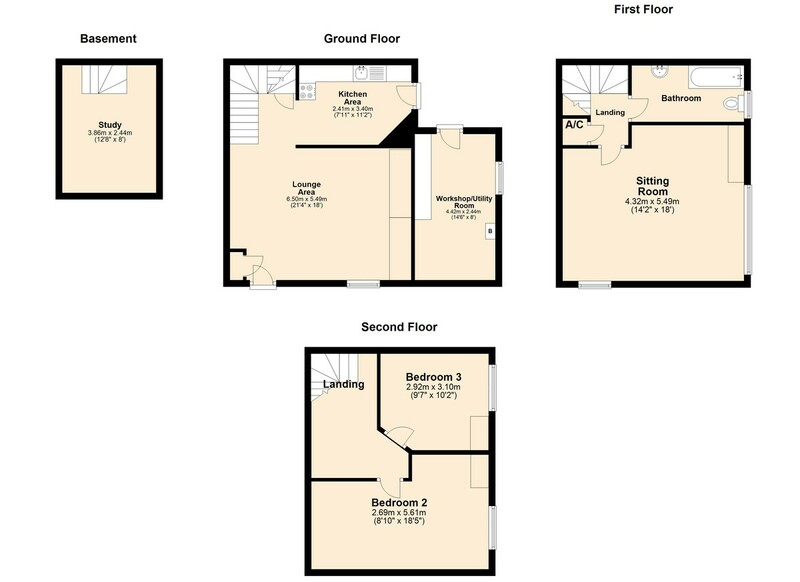 	The top floor has a good sized landing area which leads to two further double bedrooms. It is worth noting, the attic space would lend itself to a loft conversion, subject to the necessary consents. 	Lovely courtyard garden with feature walling and paved patio provides a private area great for 'Al fresco' dining. 	Home office/ Craft Room  the current outbuilding has been converted into a great 'bijoux' room offering a rustic feel with feature timber cladding to ceiling and flagstone flooring. Separate brand new fitted cloakroom. There is also plumbing for washing machine to the side. Gas Central Heating, Mains Water and Drainage. Residents parking permits can be purchased from Herefordshire Council for approximately £30.00 per annum.